Once a church, now a museum, Nikolaikirche (St. Nicholas' Church) has been a landmark of the Berlin city centre for over 800 years. The basement floors of the twin-towered building, which are made out of natural stone, are considered to be the oldest existing rooms in Berlin. Our permanent exhibition, From the Base of the City to the Double Spire, offers visitors insights into the history of the church and the surrounding Nikolaiviertel (St. Nicholas' Quarter), which is the area surrounding it. Our events, concerts and a weekly finale with organ music are plenty to tempt you to pay us a return visit. We also offer a special programme for children and young people. The Nikolaikirche was more than just a religious centre and burial place for important Berlin families; it was also the city council church and an historically significant location. The first assembly of the city council was sworn into office in it in 1809. Shortly after German reunification, the first freely-elected Berlin-wide city parliament convened here in 1991. From 1939, the Nikolaikirche was no longer used as a church; in 1987 it was re-purposed as a museum. Following comprehensive renovation, it has once more been open to visitors from the entire world since 2010. The church has been structurally and stylistically transformed several times over the course of its history. Its construction and furnishings have reflected the creative civic drive and economic power of the people of Berlin. Since the end of the 19th century, its distinctive double towers have defined the skyline of the city centre. During the Second World War, in 1944, a bombing raid completely destroyed the Nikolaikirche. It remained in ruins until reconstruction began in 1984. Thanks to the financial support of the European Union, the Stadtmuseum Berlin was able to renovate the building from 2008 to 2010 in order to make it visitor-friendly. 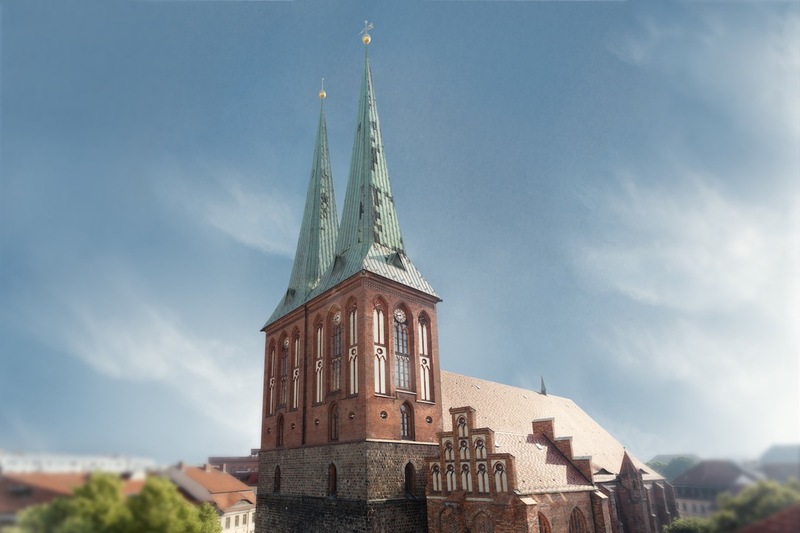 With its tumultuous history, the Nikolaikirche is now once again an intact historic monument. St. Nikolai is not just a history museum. It is also great venue for concerts, such as Nikolaikirche's weekly Friday Concerts and other musical events. Listen and enjoy! These brief 30-minute concerts feature works of great composers as well as chamber music with Nikolaikirche's wonderful Jehmlich organ.